This is a Kool Mist spray coolant system (manual). I use it mainly for air cooling & chip removal. A momentary, solenoid-activated liquid control valve will allow very short deliveries of liquid lubricant. 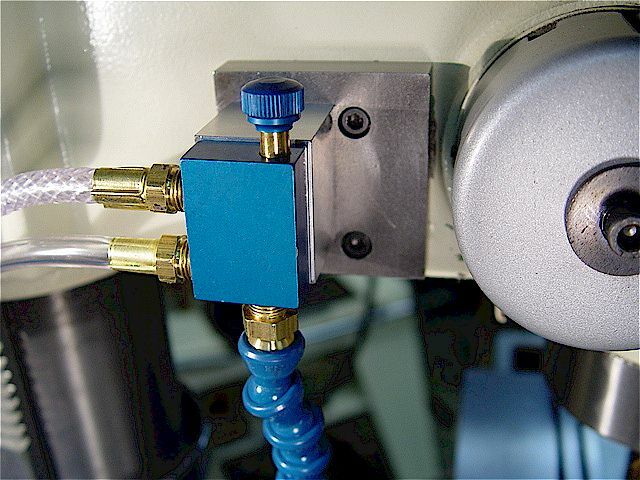 The solenoid can also be controlled via g-code using Mach3 & its relay box in a CNC application. 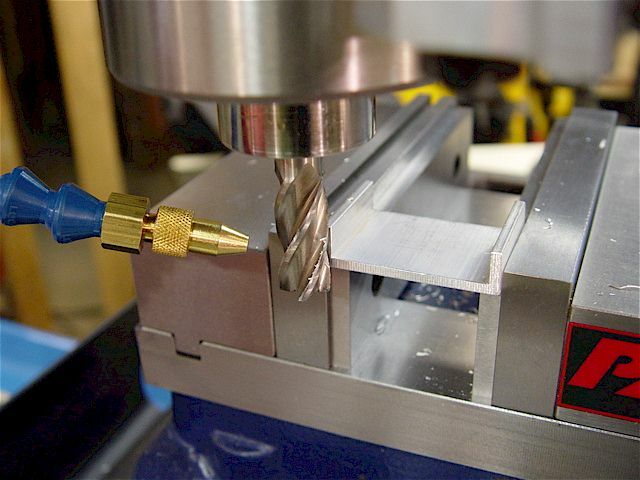 The nozzle moves with the cutter. The paint was too thick & the magnet too weak to allow a strong attachment. 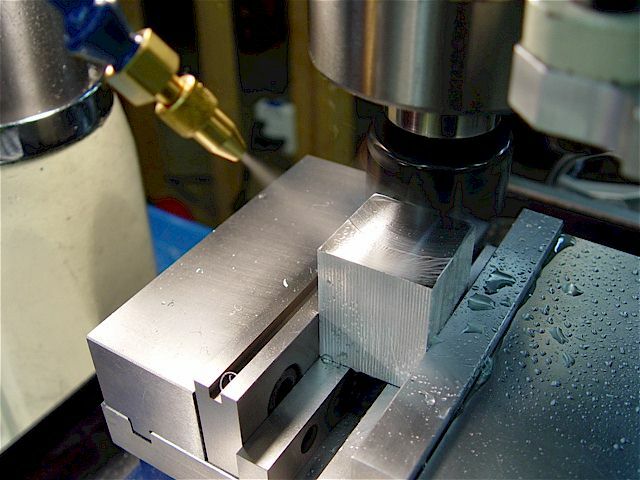 The liquid/air mix valve is attached to a 1/2" steel plate that has two 10-32 cap-head screws threaded into the mill. Coolant/air mixture valve mounted on steel base with aluminum spacer block. A 10-32 cap-head bolt fastens the unit from the plate's back. Brass spray nozzle is adjustable. A thin air line is inside the main, bendable tube. Coolant & air mixed at the tip. Also see the Hand Tools Section. 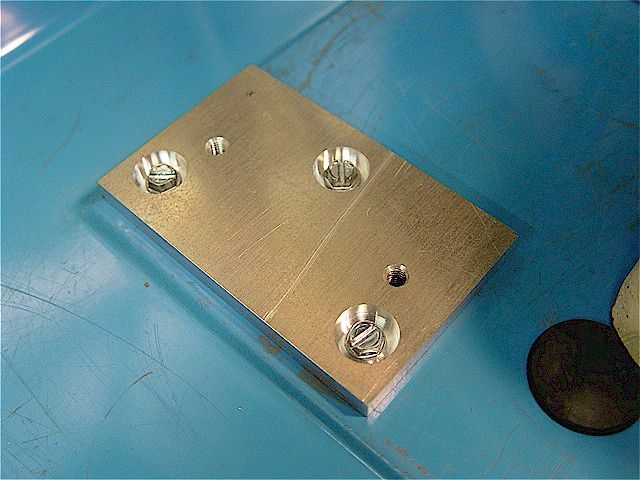 Sub-plate mounted onto the left-rear of the mill stand with three sheet metal screws. The plate has 10-32 bolt taps for the L-bracket. 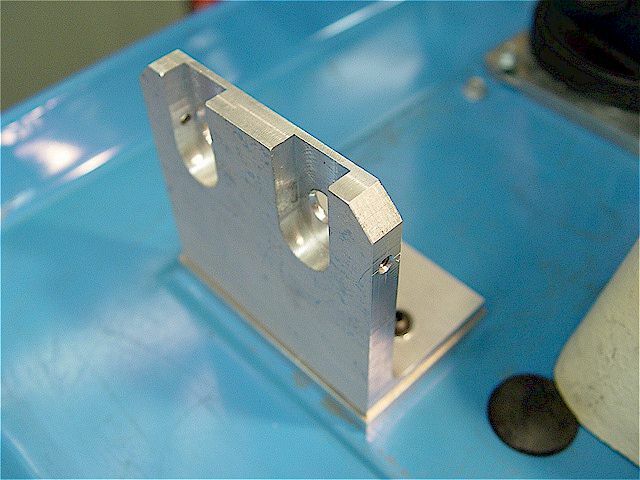 L-bracket milled to hold the air valves. The channel is 5/8" to trap the connector nut. Note the 6-32 set screws (above) were changed to 10-32 (below) for a better grip. 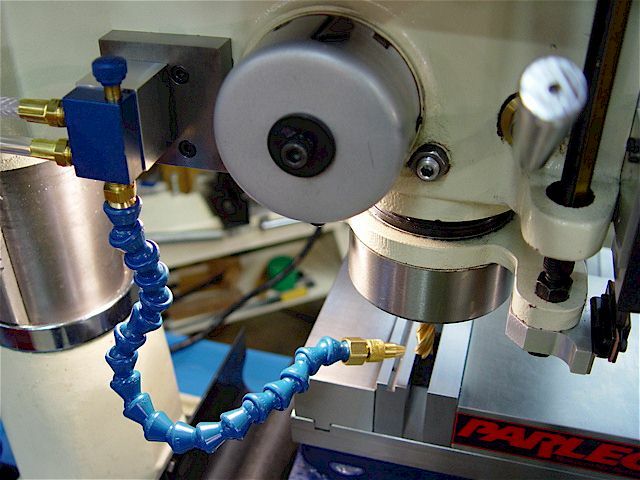 Installed 1/4" NPT (6.4 mm) mini-ball valves to control both the air & coolant supplies. The air valve & the spring-loaded quick connect/disconnect mount through the bracket. 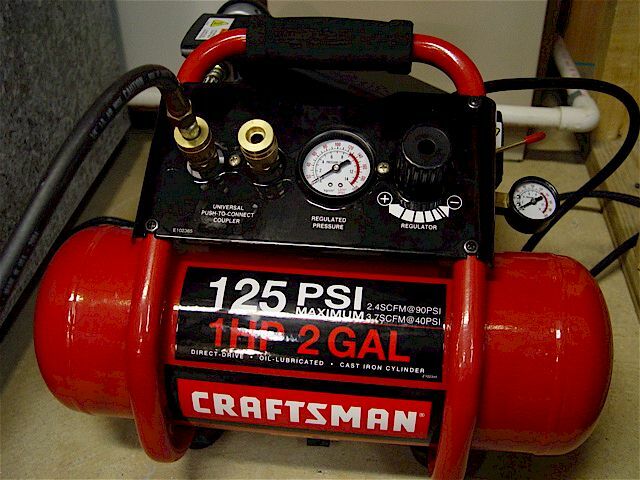 higher (70-90 psi) pressures. The two valves allow good control over both air & coolant. 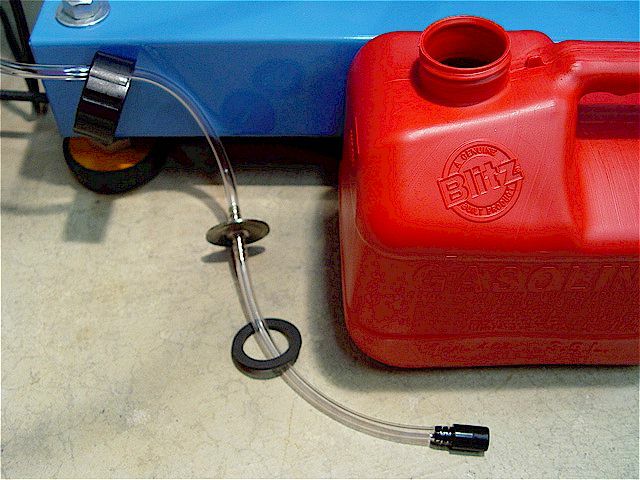 Coolant tank made from a 1 gal. 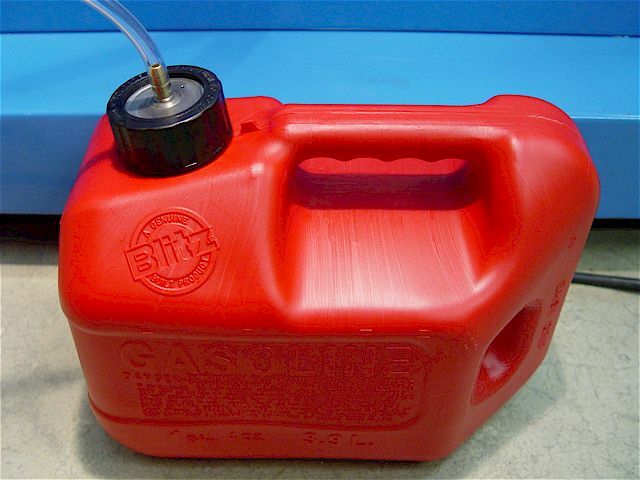 gas can which is low cost & chemical resistant. 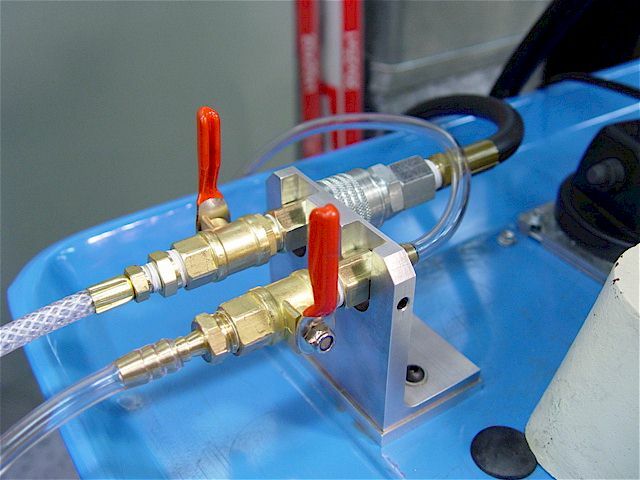 The coolant pick-up tube end has the Kool Mist particulate filter/anti-siphon valve. The metal lid has a 1/16" hole to let in air. The coolant is Kool Mist 77 diluted 1:20 distilled H2O. 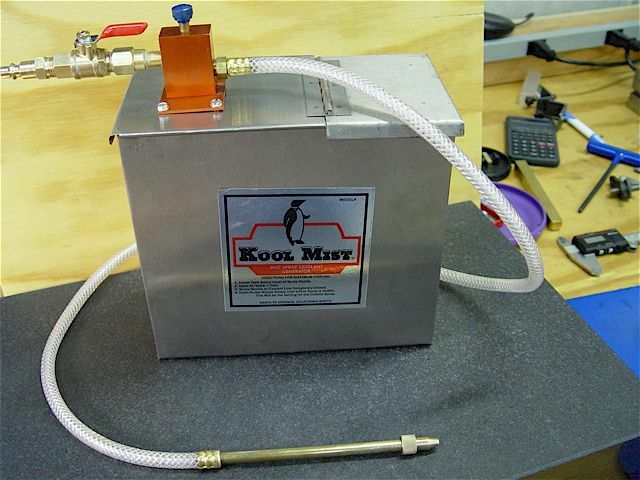 Kool Mist SS coolant reservoir with mixing & air supply valves.